Third part of a classic real-time strategy series set in fantasy world started in 1994 by Blizzard studio. It takes us once again to the land of Azeroth known from previous games, where forces of humans, orcs, and night elves face invasion of undead known as Plague. The third installment in the brilliant strategy game series, WarCraft, sometimes referred to as Role Play Strategy which is the next phase in RTS evolution. In this game, we get to participate in the conflict between humans, orcs, the undead and night elves. Each race has their very own units and magic thanks to which tactics and strategies are different for every faction. Every side of the conflict also has their own heroes. They may gain experience and develop their unique skills (control elements and magic, positively influence their allies, etc.) and also use the items acquired. 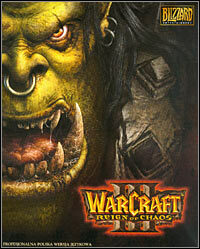 The heroes are also important to the storyline of WarCraft III and are transferred between scenarios. WarCraft III has an advanced graphic engine which allows for displaying 3D graphics in a high resolution. Moreover, it offers incredibly complex and enthralling story and gameplay, evidenced by thousands of fans all over the world. Blizzard, as always, ensured that the game has multiplayer feature, using Battle.net servers. The multiplayer offers a few game modes, such as team play and quests. Huge land of Azeroth full of life with lots of towns, strongholds, temples and fierce beasts. Advanced world editor that elongates gameplay. It allows to freely change all the elements of the game, from the unit appearance to AI. Game score 8.635 / 10 calculated out of 5260 players' votes.